Setting up your first aquarium may seem like a daunting task, however, it’s quite simple and with a little guidance, you should be on your way! As a friendly tip, I would suggest performing a leak proof test by filling your tank up with water and having it sit for 24 hours (some test for a whole week which may not be necessary). Once that is completed, I would resume setting up your tank. If leaks are found, you have two choices; you can choose to return the tank or take matters in your own hand and re-seal the tank (glass tanks). *Quick tip: Make sure your tank is fully cycled before proceeding to add fish. To get started, you will need these basics items when setting up your new aquarium. Make sure you rinse before laying them in the tank, with the exception of live plants substrate. Live plant substrate could cause cloudiness if rinsed and not necessary. Water, fish net, fish and make sure your tank is cycled!!! This is the simplest setup in the saltwater hobby, with just having fish only (FO), however, it is not uncommon to have some algae and detritus eating scavengers in the tank. A typical FO setup is just with fish with no live inhabitant present. That means no corals, live rocks or motile invertebrates. Some aquarist would choose to take the route of placing synthetic decorations instead. The most common fish for this type of setup are aggressive fish that are usually either too big or not compatible in a community. Examples of these fish would be Triggers, Lionfish and Eels. A fish-only with live rock (FOWLR) setup is the name suggests an aquarium with just fish and live rock. When you think of a reef, one word comes to mind and that’s majestic. The coral reef is just simply amazing and beautiful. The latest Disney Animated movie “Nemo” has brought more popularity and curiosity to the reef hobby. Most people are simply amazed and dazzled by its beauty and exotic settings and wanting to replicate what they see on TV. The inhabitants in a reef are much more sensitive to water parameters that your typical freshwater species. Given the proper time and research, you can simply own a piece of the ocean right in your very own home. A reef consists of a variety of compatible fish, corals, live rocks and invertebrates. Some prefer just having corals and no fish, while others prefer to have a full blown community of fishes and live corals. The fishes in a Reef system are typically timid and compatible with one another. If you are setting up a salt water aquarium, there are three common themes that most people go with and each is different in nature. Let’s review each of them in more detail. Is as important as your routine maintenance, a Quarantine tank is a separate tank set aside for isolating injured, sick and new fish before placing them into the main display tank. It is recommended that the aquatic species whether it be fish or snail, be placed in the quarantine for at least two weeks and monitored for any signs of sickness before final transition into the main display tank. If any sickness is spotted, attempt to diagnose the fish and treat in the Quarantine tank. Tip: One sign that the fish is in good health is that the fish is accepting food and eating properly. To ensure new fish are free of diseases and to cure them before placing them into the main display tank. Diseases may be very contagious and can wipe your entire tank out if not careful. Curing any sick or injured fish: Perhaps there is a bully in the tank and you may want to remove the injured or sick fish from further damage. With time and proper care, the isolated fish will heal. 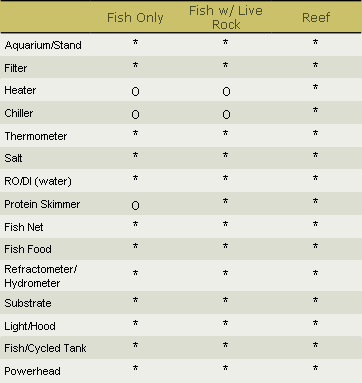 A typical Quarantine Tank would include a heater, thermometer, filter, light, and bare bottom tank with no substrates. A refugium is essentially a “refuge” from predation. It’s a separate tank isolated from the main display tank. Microorganisms and various species can live and breed without predators. They can reproduce safely, however, for the pods, given that they are so small, they are will be sucked through the return line and enter into the main display tank as food source. The rate would be slow enough that the population will never be affected. Other purpose of the refugium would be for advance biological filtration, nutrient export, surface agitation, and oxygenation. Refugiums are usually part of a sump tank where one part of the tank is reserved for the refugium. The refugium lighting cycle are often opposite from the main tank to keep the pH levels more stable. Usually the refugium would be 1/10th of the main tank volume. Refugiums are often in the stands under the main display or on the side outside of the tank. 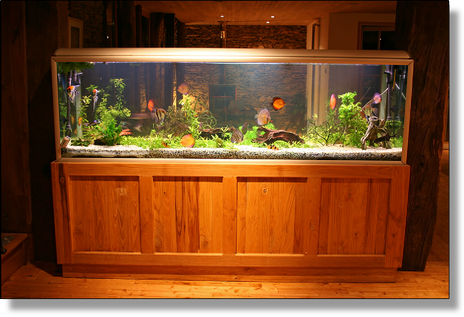 Refugiums can be found in various styles from the hanging on the back of the tank to a separate tank sitting beside or underneath the main display tank. 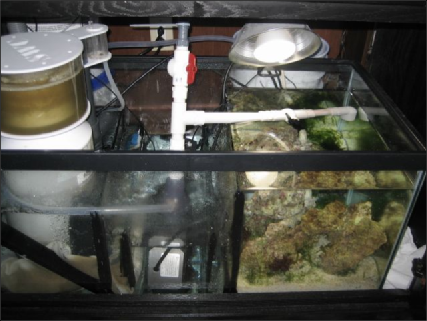 The Marine/Saltwater refugium are mainly seen in the marine/saltwater hobby as a place for hosting pods (amphipods, copepods, and isopods), brine shrimp, and plankton which are food source for fish. The Saltwater refugium usually contains live rock and live sand, macroalgae and small scavengers and fish. The macroalgae helps rid of nuisance algae which would cover the glass of the tank causing an unpleasant appearance. The Freshwater refugium would have a large collection of aquarium plants and scavengers such as snails and shrimps. The more popular refugium plant choices include Anubias, Java Moss, Cabomba and Vallisneria for their hardyness. Freshwater refugiums are often used to raise Daphnia, Gammarus and Moina for the fish in the main display tank. ← What does Cycling your Aquarium mean?